I’ve never liked radishes much. I wasn’t fond of their “bite”, but I would eat small slivers occasionally. It was never something I’d willingly buy – until I kept seeing raves about eating them roasted on the “THM Beginners” Facebook page. Review after review praised the flavor and texture, with many ladies saying they reminded them of potatoes. Potatoes? Really? This I had to try for myself! On my next trip to the grocery store, I bought a bag of radishes. Score one point for them being rather inexpensive. One bag didn’t look like much, but since it was my first time to cook them and I didn’t want to end up with a lot of waste just in case we didn’t like them, I decided against getting two of them. After a day or two of leaving them alone in the veggie drawer of my refrigerator, I decided to just make them and see what all the fuss was about. The recipe was basic and simple, and I couldn’t wait to try one when they came out of the oven. After they had a little time to cool down, I popped one into my mouth. Oh. My. Goodness. It was so good! It was soft and sweet and there was no “bite” to it. I wasn’t sure what it reminded me of, but it wasn’t a potato. I had another. And another. I made myself stop because I wanted to be sure there were enough to share with the guys – and for me to still have a full serving. The boys looked at them and asked what they were. I didn’t want to tell them until after they had tasted them. Like me, they’re not fans of raw radishes. I told them to try a bite first, then I’d tell them. They loved them and were pleasantly surprised to learn they were radishes. They ate every bit I had put on their plates! I must confess that my husband didn’t like them. Then again, he loves raw radishes and he just couldn’t wrap his mind around the different taste and texture. I don’t think he thought they were bad, just very different. I told him that whenever I cooked these in the future, I’d leave some raw ones out for him – for which he was grateful. For those of you following the THM eating plan or watching your glycemic index, radishes are non-starchy vegetables with a low sugar content. (I was surprised about that since they are a root vegetable.) Cooked this way, they are an S.
Wash and dry radishes and slice off ends; cut into quarters. Toss with oil and seasonings. Place radishes in a single layer on a baking tray. Bake for 20-25 minutes or until soft, stirring around about halfway through cooking time. 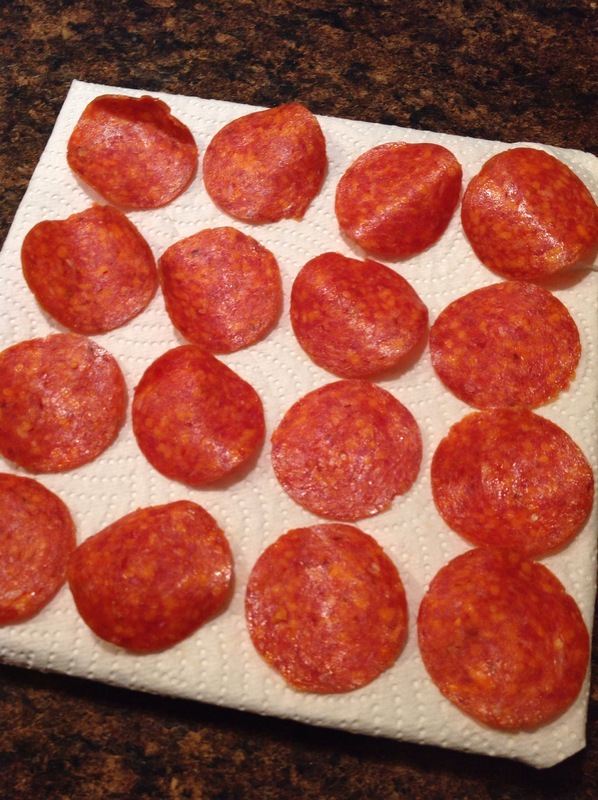 I’m not a fan of pepperoni, mainly because of all the grease pools it creates. But when I saw a picture of Pepperoni Chips on Pinterest, they looked really good. Dry. Not the least bit greasy. 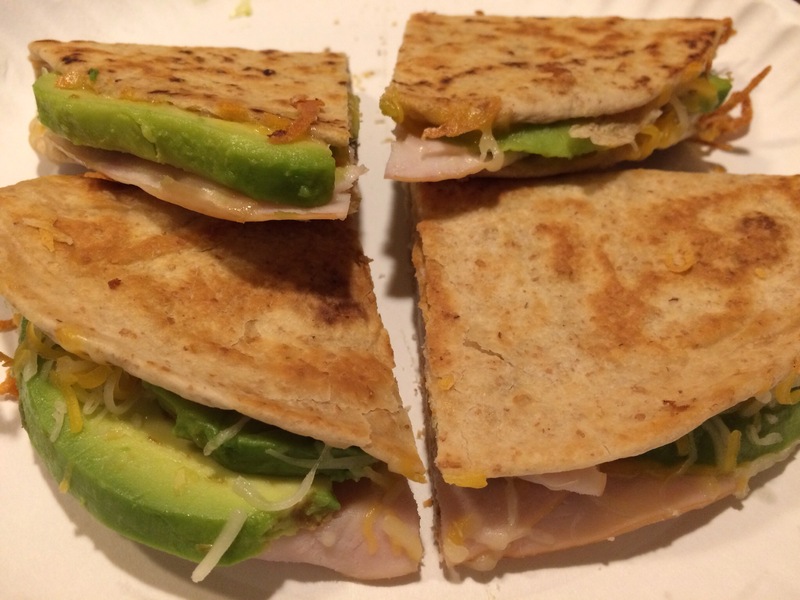 I finally tried them – and they were great! Four thumbs up from the four of us! And a bonus: they’re an acceptable THM (S) food! Now I occasionally make them for snacks, as part of the boys’ lunch, or as a side to some meals. They’re quick, easy, and much healthier than eating them straight from the package (yuck!) or sitting in a pool of grease on a slice of pizza. Cover the top of a microwave-safe plate with a double layer of paper towels. 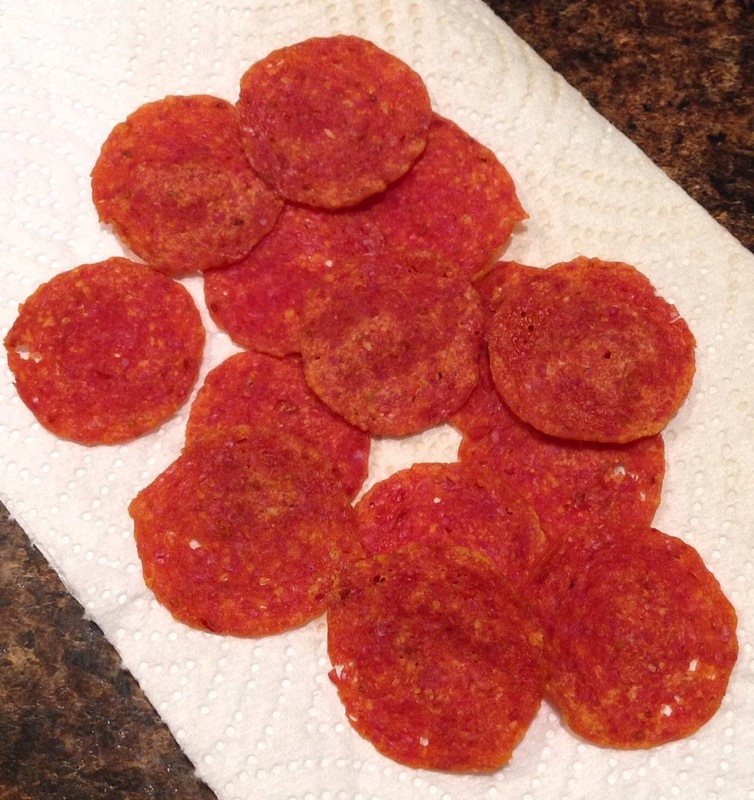 Place one layer of pepperoni slices on top of paper towels and cover with another paper towel. Microwave on HIGH for one minute. Let cool before eating. They’re great plain, with crackers and cheese, with pretzels and marinara, etc. We love Tex-Mex! This was one of the food choices at a night of basketball games at my son’s school. Once I tasted it, I knew I had to have the recipe. As it turned out, a friend of mine had made the restaurant pan full and donated it to the concession stand. A few months later, she made pans of it for me and two other friends – and she included the recipe. It has quickly become a family favorite! I’ve tweaked things or added an extra ingredient here and there, as is my habit, but it’s always great. Heat oil in a large skillet; begin sautéing onion and peppers. Add ground meat and brown until fully cooked; drain. Return to skillet and add taco seasoning mix and water. 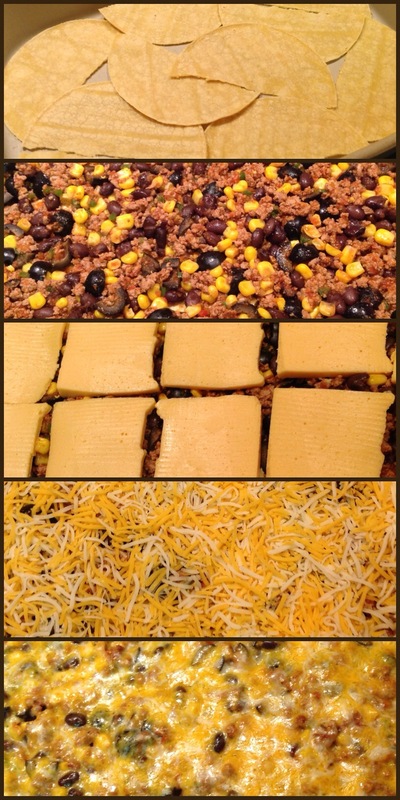 Bring to a boil, then stir in Ro-Tel, beans, corn, and olives. Remove from heat. Place 8 tortilla halves in bottom of 9×13 baking dish. Top with half of the meat mixture, then lay slabs of Velveeta on top of that. Layer 8 remaining tortilla halves and the rest of the meat mixture, then top with shredded cheese. *If you have fresh corn on the cob, cut the kernels off the ears and sauté them in a skillet with some onions and peppers in place of the canned corn. I always like one-dish skillet meals that are quick and easy. 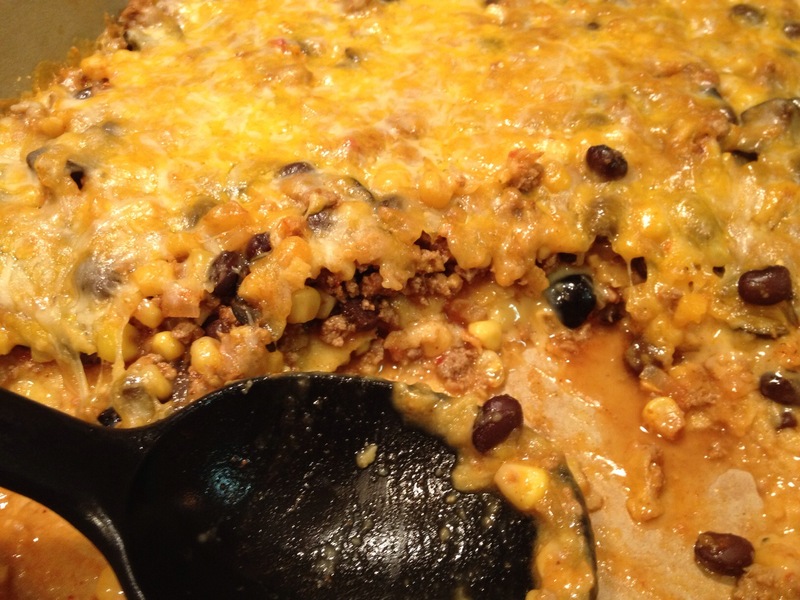 My mom shared a version of this recipe with me, and it’s now a new family favorite! Heat oil in a large skillet over medium high heat. Brown potatoes, stirring frequently to prevent burning. Add onion and continue stirring until onions are clear. Stir in mushrooms and sausage. Reduce heat to medium low and cover skillet. 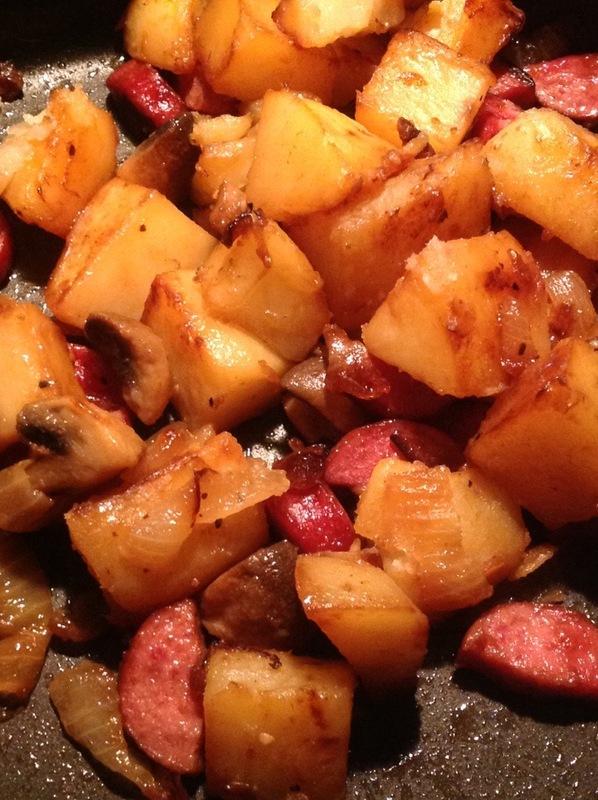 Cook until sausage is browned, stirring occasionally. Season to taste, then serve. *My mom also uses sliced carrots in her recipe. She uses garlic pepper instead of the Montreal Steak Seasoning. Use whatever veggies you like: sweet potatoes, asparagus, green beans, squash, etc. I think some fresh spinach cooked into it would be a nice touch. We love soft pretzels, but I thought they’d be difficult to make. A friend of mine makes them often, and after snacking on a few of hers, I decided I wanted to try them for myself. The recipe in my bread machine booklet called for shortening, which it don’t use, so I was put off again. Finally I read up on substitutions and found I could use butter instead. I couldn’t believe how easy – and delicious they turned out! Now they’re a family favorite. I can’t wait to have them this winter along with tomato soup, chili, gumbo, etc. Add warm water to bread machine pan. Add bread flour, dry milk, sugar, and salt to pan; tap pan to settle dry ingredients, then level. Cut butter into small pieces and evenly distribute in the corners of the bread pan. Add yeast to center of pan. Lock pan into bread maker and program for DOUGH; start machine. When dough has finished, remove from pan and knead on a floured surface for 1 minute. Roll out into a rectangle, about 1/2-inch thick. Cut dough into 16 equal pieces. Shape each piece into a ball or a pretzel. 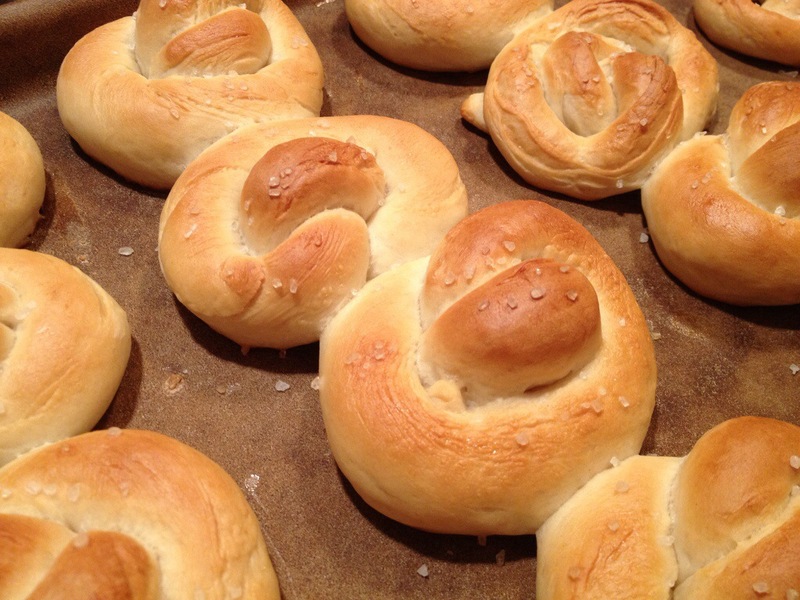 (For a pretzel shape, roll each piece into a long rope, then cross the ends and twist them twice. Fold ends across to opposite side and tuck under. Place pretzels on greased baking sheet, cover, and let rise in a warm, draft-free place for 30-50 minutes until slightly risen. Preheat oven to 375 degrees. Brush pretzels with egg whites, then sprinkle with coarse salt. Bake for 20-25 minutes or until golden brown. Place on rack to cool. Serve as a bread with soups or as a snack with dipping sauces. We like homemade marinara sauce, honey mustard, or warm queso. *For chewy pretzels, bring 2 quarts of water to a boil in a large pot. Add 1 Tbsp. of salt to dissolve. Reduce heat to simmer and place 2 to 3 pretzels in hot water. Simmer one minute on each side. Remove with a slotted spoon, drain, and place on grease baking sheet. Brush with egg white, sprinkle with coarse salt, and bake as directed above.